Families enjoying a Saturday adventure together on March 11th had the chance to explore different aspects of the ecosystems around them, including ways that wetlands help them and native wildlife. Coastal Wetlands Planning, Protection, and Restoration staff exhibited materials and games at the Estuarine Habitats and Coastal Fisheries Center as part of 2017 Family Adventure Day to benefit the non-profit Healing House in Lafayette, LA. This annual event sends families to different locations throughout Lafayette for experiences that range from face painting to coming face-to- face with a snake. Over 250 people stopped by the Center where they had the opportunity to see a demonstration of how coastal wetlands protect interior communities and wildlife habitat from storm surge. Visitors could pick up recent issues of WaterMarks and other materials on wetlands restoration projects in coastal Louisiana. Kids also received Henri Heron’s activity book and helped match Louisiana wildlife with the wetland habitat they need to survive. Other exhibitors, including US Fish & Wildlife Service and Louisiana Dept. of Wildlife & Fisheries, focused on topics like bat conservation, beekeeping, endangered species in Louisiana, and fishing. Helping families understand and appreciate the diversity of natural environments in Louisiana helps ensure that those environments will be present in the future. Wetlands provide a critical nursery for many of the Gulf of Mexico commercial fishery species. One of the most significant fishery industries in the lower 48 states is the Gulf Coast fishery. 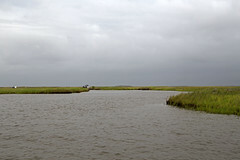 Louisiana wetlands, particularly coastal marshes, play an imperative role in the life cycle of about 90% of Gulf marine species such as oysters, blue crabs, and shrimp. Providing a protective nursery, wetlands house an immensely diverse quantity of species that rely upon this habitat such as blue crabs, menhaden, and redfish. The Coastal Wetlands Planning, Protection, and Restoration Act aims to continue the protection and restoration, and health of these essential habitats for wildlife, aquaculture, and fisheries.